I’m letting you behind the curtain. This is the story of how “Tiny Grass” was made, and I want to tell it right. So, for the optimal experience, follow the tour guide, patiently, instead of running straight for the main attraction (for the impatient, the link to the finished song is at the end of the blog post). A blond guy, gløgg and a piano — like many good things in life, that’s how “Tiny Grass” began. 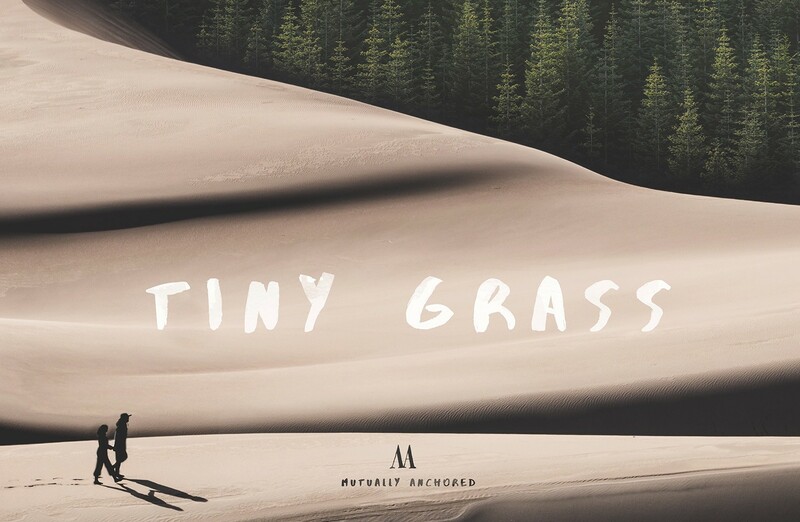 “Tiny Grass” is the first officially released song from a band called Mutually Anchored (website to come). Half the band is a guy called Alrik Fallet, the other half is, well, me. We’re more of a duo than a band, I suppose, but it sounds more serious to say we’re off to band practice than that we’re going to “play some music with a friend”. So, a band we are, albeit a tiny one. We started playing together last winter, but took our time (this is going to sound so hipster-y) finding our sound. Our first original song actually wasn’t “Tiny Grass”, but one called “This Is Golden”. I sent Alrik the lyrics with some notes on how I pictured the music, and he created a four-handed piano piece with intricate vocals on top, something we still haven’t managed to play successfully more than a handful of times. So, to rein in our ambition a tad, we made something tiny. Except it’s not tiny at all. As you can tell, the song was still a rough sketch. With just a single voice and some basic piano it’s so… bare, and it takes a certain kind of person to imagine how it might transform. Because of this, the next bit was the scariest: sending it to Alrik. I’m not exaggerating when I say that sharing unfinished work makes me feel more vulnerable than getting physically naked. But I sent it. He liked it. Phew. I told him to do whatever he wanted with it, which is my favourite part — seeing (well, hearing) something I made transformed through someone else. There’s a lot of trust involved. Fortunately, my trust was not misplaced. Getting to know Alrik, it quickly becomes clear that music plays a major, major part in his life. Some aspects are easy to put your finger on. There are instruments everywhere. He has a playlist for everything. He has a musician’s hands. Then there are the things you only discover after a while, like how he speaks the language. I don’t mean that he knows fancy words for tempos and certain beats, but rather that he can talk about music in a way that makes sense musically, and the words can then be translated into actual music. For instance, we talked about how a certain bit of vocals should be like something silvery, clear and shiny on top of everything else, and I think we made it happen (it’s the four words at the very end of the lyrics below, if you’re curious). In short, Alrik picks up both concrete instruments and abstract musical concepts the way others pick up a pair of dropped socks: quickly, casually, naturally. I’m a very lucky girl (who’ll now stop singing his praises so his head won’t grow too big). Quite a change, huh? And it just got better and better. The major breakthrough came when we decided to go for a full studio production, instead of something we’d be able to play live as well. Suddenly there were a lot more strings. A bright piano. A fearless electric guitar. One day I came home to an e-mail where a whole choir of bearded Alriks had been added. New details, different rhythms, layer upon layer. The core of the song was the same, but it had (dare I say it?) grown. We’ve also made a Facebook page and a YouTube channel for Mutually Anchored, and there’s a proper website on its way. I’m sitting here with goosebumps all over. This was magical. Thank you so much, Frida! We’ll try to make everything a bit magical, because all the best things are. Gorgeous. The story. The song. The anticipation of more to come. Now this is strange. I’m sitting here, goosebumps all over and Frida commented on stitting there, goosebumps all over. That is the short form of my own name and many people call me by that form. Thank you for that song. I’ll take it with me into this new year. I have been reading your blog for a while now, seeing it change, always happy to see something new. As for the blog, I’m still trying to figure out what to do with it. Most of my writing time goes into the novel I’m working on, and I struggle with what people might find interesting here since I’m not writing about fasion anymore. Just writing about myself/my life/my own thoughts seems so… indulgent, and I can’t imagine it’ll interest anyone but myself. Also, any kind of “advice” I give feels… silly, as I’m only 30 and mostly feel like I don’t know anything about life at all. Who am I to give advice, really? This sounds lovely! It reminds me of both Tori Amos and Draumir, which is definitely a good thing. I love the story of how your idea evolved into something completely different, yet recognisable. Thank you, Silja, that’s a lovely compliment indeed! you’re like me. you have to explain the process of a thing because you want people to see the magic of the becoming. <3 ps: i'm so overcome by the cover art. who did it? Yes, that’s a good way to put it, “the magic of the becoming” 🙂 I don’t think art _needs_ an explanation or backstory, but I often appreciate it because it allows me to understand it in more than just my own way. Not just interpretation-wise, but also in terms of technique, history, those sorts of things. – combined with some drawing and adjustments, to make the people look a bit more like Alrik and me. Both images allow for commercial use, as do the main font (https://www.behance.net/gallery/30993269/Abys-Typeface-free-font). I really like the mood they set together! Hello! I found you via Pinterest, and I have to say that this song was unexpectedly wonderful – I say that because it’s not what I expected to find on a blog. Your lyrics are poetic, the concept very unusual, and the harmony is interesting – I’d say it’s almost modal (is it? I’m sick and my ears aren’t working very well at the moment ?). Anywho, it’s clear that you both have deeply artistic sensibilities and that you compliment each other well. I can’t wait to see what else you guys produce! I have no idea how it has taken me over 6 months to listen to this wonderful song, as I have read your posts within days of them being published for years! Regardless, I am so glad I have finally listened, as I think I have just experienced something rather magical. The song is incredible, and I love your voice. In a few of the earlier comments you have written about being unsure about the future of this blog. While I am greatly miss your posts, as they always seemed to manage to inspire me while also making me feel more content and comfortable in myself, I am so happy that you have found new things to inspire you and occupy your time. If you get the chance, I would love it if you could recommend any blogs which you enjoy reading which you think readers such as myself might also enjoy. I haven’t had much luck finding new blogs to love, and since both you and Maja (who I found through you and have been following for almost as long) have become much more irregular posters, I would love to have a few more blogs to follow which have the same mix of fashion, mental health, thoughts, and just day to day life. I always found that I could relate to your posts in the most wonderful way, and I hope I can find another corner of the internet that creates a similar feeling.